The ‘Force’ is still strong nearly 40 years later. Star Wars has captivated the public’s imagination since the first (or IV’s) film debuted in 1977. Now, with Star Wars: The Force Awakens in theaters, the cultural phenomenon is once again sweeping the nation. Flying at warp speed off the screen, the franchise has taken on a life of it’s own inspiring multi-billion dollar merchandising deals and thousands of obsessive fans. Something in George Lucas’ films and the mythology around them wields a powerful force (pun intended) that captures our collective imagination. Though, in the end, the numbers will speak for themselves; the film is projected to make a record $9 billion dollars (tickets and merchandising), it’s worth taking time to stop and examine why these films hold a Jedi-like grip over our minds. “Star Wars is made by LucasFilms and kept alive by the fans,” said Rubin Polizzi, 32, local director of the New York Empire Saber Guild. 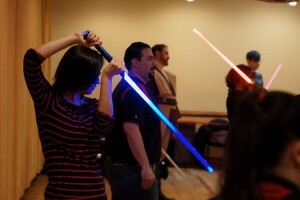 Formed three years ago, the all-volunteer LucasFilm-recognized Jedi and Sith group, Empire Saber Guild trains in, and teaches, lightsaber choreography. With chapters spanning the globe, the guild has significantly grown since its founding nine years ago, and now has more than 200 members worldwide. 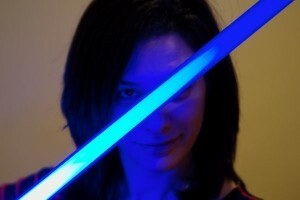 Empire Saber Guild goes beyond cosplay and cheap pageantry. They literally enter into the world of the films by bringing the franchise to life. The group executes lightsaber combat forms developed and extrapolated from the novels, with martial arts-sounding names like Shii-Cho and Djem So. Far from anything you can purchase from a toy store, these sabers are customizable and made by specific retailers, costing anywhere from $300 to $1,000. 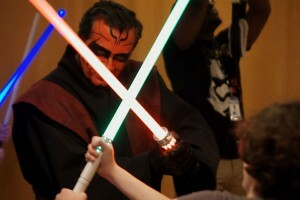 “One of the best moments for me was at the children’s show, doing a saber fight with Darth Vader in full costume. I felt like I was five years old,” said Derek Hidalgo, 42, assistant local director and one of the chapter’s founders members. Yet, the level of commitment to the Star Wars-verse in the group goes far far beyond lightsabers and costumes. Modeled on the Jedi principle of “spreading hope and good will,” all proceeds from the performances go to charity. already raised more than $8,000 this year for charity, giving back to the community through their fandom. They also regularly perform at children’s hospitals and community centers. This message is also tailor-made for the geeks of this world; the cultural odds may seem to be against you, but you shall overcome. 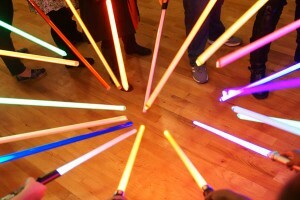 Yet, the implications don’t seem to bother the Empire Saber Guild’s Jedis and Siths, who wholeheartedly embrace their fandom and it’s effect on audiences.